This image of Saturn's famous north polar hexagon, captured by the Cassini orbiter, was first published in 2012. The weird hexagon swirling around Saturn's north pole is much taller than scientists had thought, a new study suggests. Researchers have generally regarded the 20,000-mile-wide (32,000 kilometers) hexagon — a jet stream composed of air moving at about 200 mph (320 km/h) — as a lower-atmosphere phenomenon, restricted to the clouds of Saturn's troposphere. The hexagon, which surrounds a smaller circular vortex situated at the north pole, has existed for at least 38 years; NASA's Voyager 1 and Voyager 2 spacecraft spotted the sharp-cornered feature when they flew by Saturn in 1980 and 1981, respectively. Scientists started to get much more detailed looks at the hexagon in 2004, when NASA's Cassini spacecraft began orbiting the ringed planet. But Cassini's hexagon observations were pretty much confined to the troposphere for a decade after its arrival; springtime didn't come to Saturn's north until 2009, and low temperatures in the stratosphere continued to compromise measurements by the probe's Composite Infrared Spectrometer (CIRS) instrument for another five years. 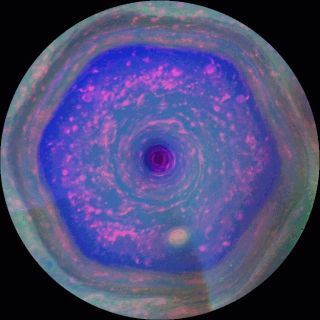 Brightness maps of the stratospheric hexagonal vortex at Saturn’s north pole, as seen by the Composite Infrared Spectrometer instrument aboard the Cassini spacecraft. From left to right, the panels date to Aug. 17, 2013; Oct. 18, 2014; June 9, 2016; Sept. 20, 2016 (top row); Nov. 8 2016; Feb. 12, 2017; April 17, 2017; and Aug. 26, 2017 (bottom row). "We were able to use the CIRS instrument to explore the northern stratosphere for the first time from 2014 onwards," study co-author Sandrine Guerlet of the Laboratoire de Météorologie Dynamique in France, said in a statement from the European Space Agency (ESA). Those observations have now been newly analyzed. And they revealed a surprise: the presence of a familiar shape high above the clouds. "As the polar vortex became more and more visible, we noticed it had hexagonal edges, and realized that we were seeing the pre-existing hexagon at much higher altitudes than previously thought," Guerlet added. But the southern stratospheric vortex wasn't hexagonal. And neither, for that matter, is the vortex that spins around the south pole lower down, in the tropospheric clouds, the researchers said. "This could mean that there's a fundamental asymmetry between Saturn's poles that we're yet to understand, or it could mean that the north polar vortex was still developing in our last observations and kept doing so after Cassini's demise," study lead author Leigh Fletcher, of the University of Leicester in England, said in the same statement. A Cassini view of the hexagon in grayscale, captured in late 2016. That demise came on Sept. 15, 2017, when mission team members steered Cassini into a fiery death in Saturn's atmosphere. The long-lived orbiter was low on fuel, and the team wanted to make sure Cassini never contaminated the Saturn moons Titan and Enceladus — both of which may be capable of supporting life as we know it — with microbes from Earth. The asymmetry between north and south is just one vortex-related mystery that scientists are chewing on. Another is the northern feature's striking shape: It's unclear why the jet stream should form into a hexagon. Earth's jet stream has done no such thing, for example. The $3.9 billion Cassini mission — a joint effort of NASA, ESA and the Italian Space Agency — also dropped a lander called Huygens onto Titan's surface in January 2005. As the new study shows, data gathered during the mission could still help solve some of the ringed planet's perplexing mysteries, even though Huygens and the Cassini orbiter are no longer with us. "The Cassini spacecraft continued to provide new insights and discoveries right up to the very end. Without a capable spacecraft like Cassini, these mysteries would have remained unexplored," ESA Cassini-Huygens project scientist Nicolas Altobelli said in the same statement. "It shows just what can be accomplished by an international team sending a sophisticated robotic explorer to a previously unexplored destination — with results that keep flowing even when the mission itself has ended." The new study was published online Monday (Sept. 3) in the journal Nature Communications.